Rosberg is now fastest with a 1:27.333. Hamilton is second on a 1:27.509. A new rear suspension layout for McLaren. It's similar to the old design, which is unique in the pit lane and sees the rear arm of the wishbone connect much further back on the rear crash structure. Alonso hangs the rear of his McLaren out around Turn 12. That could also have been a homage to Gilles Villeneuve with the way he collected it together again. Why are the Renault engines less reliable than last year? @MichaelBialocur: Renault attempted to make some performance gains over the winter but in doing it seems they so compromised reliability. They were not happy with the way the token system was changed over the winter as they had to rush some changes and then change their strategy when it became apparent that tokens could be spent at any point during the year. 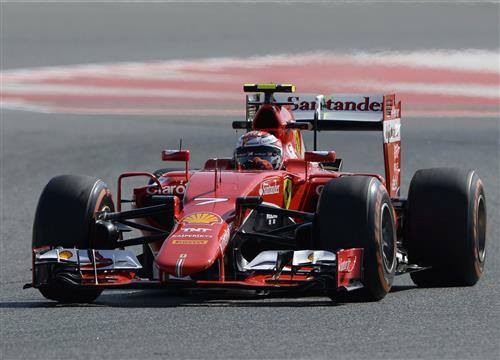 Ferrari seemed to be much better prepared and appeared to bank on the token system being changed. PDVSA money is obviously king at Lotus this year, but Maldonado systematically refusing to share his car with Palmer for FP1 shows 1. that he's insecure with his own driving, 2. that he's a ****. The first 30 minutes of the session is up so the teams can no longer use their first set of tyres for the weekend. They now get another set of hards to finish this session before new sets of hard and medium compounds for FP2. @duflop why? I wouldn't share mine! @altaf: Vettel has set a 1:28.141 and Raikkonen a 1:28.825. You can see the newly sculpted Ferrari sidepod in this photo. Quite a dramatic change as the packaging on the SF15-T tightens up. @rockedin123: It's too early in the weekend to read too much into the time, but I suspect Mercedes will hold an advantage over Ferrari here. 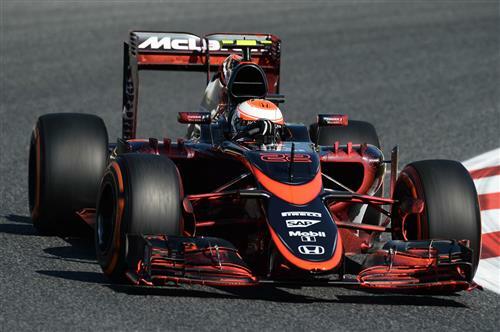 McLaren sitting on 315KPH - do you think they've turned the engine up? Stevens clocked 318KPH, so does that mean Honda is still holding back? @Heartmuscle: All these cars can hit well over 320km/h if you trim enough downforce, and therefore drag, off the car. The key is to have efficient downforce and that's what the teams aim for. Power allows you to run more downforce without compromising straight-line speed, but top speeds are not the best indicator of power. I've hoped to see more Ferraris running due to the big package they have bought here. lets hope they get out soon and start running non-stop! Forza Ferrari! @fawx: Don't forget all teams are wary of putting mileage on the engines, which are still limited to four under the regulations. That could increase to five, but until it does we could be set for a some quiet Fridays. Hamilton on 335KPH and Rosberg on 319KPH but their times are less than 2/10ths. @Bam: because it is now obvious to everybody that Maldonado can not drive as fast and reliably as his team-mate even with one more free practice at every week-end ! I used to think he was fast, now he seems totally lost. And the more he forces Grosjean to be the only one sharing his car in FP1, the more he gets beaten and it gives him such bad publicity. Stevens breaks the silence with the roar of a 2014-spec Ferrari engine and the Manor heads out on track. Any idea what has happened with Ricciardo? I am watching a local coverage in Spanish, cannot quiet understand them. McLaren even has aero paint to match the new livery! I quite like the new McLaren livery. It's refreshing. Woowwww!! The Mclaren looks smokin' hot! Vettel improves to a 1:27.846, but Hamilton smashes that with a 1:26.898. Rosberg also improves but can only manage a 1:27.043. @sumanth: They have so far, but it will only get more and more difficult. The team admits it will only score from others' mistakes this weekend. @@MifdhalAceh: Alonso's best time is a 1:29.813. That Mclaren looks like a future dominator! @dufus...enough with the Maldonado hate...it shows 1. that you are a hater and know nothing of F1. Maldonado has won an F1 race...deal with that reality. 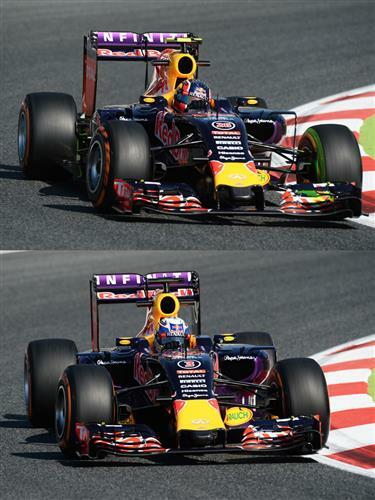 More trouble for Ricciardo as the engine cover comes off again. Clearly the team hasn't fixed the Red Bull's problems yet.